Salem Tarot: Tarot Readings by a Real Psychic! Gail Kiefer is a clairvoyant psychic adviser and medium who has provided guidance and insight for those who wish to have a better understanding of themselves for over 20 years throughout the Gulf South. Her psychic gifts allow her to assist people with overcoming their personal pit-falls, making decisions about paths to take in life, and discovering the stepping stones to personal success. 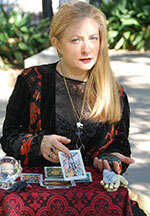 Her tools of choice to delve into the details of your life include the Tarot, and palmistry. Let Gail lead you on a path of self-discovery and enlightenment. Gail Kiefer has been a psychic advisor and Tarot and palm reader for over 20 years, and has created a clientele base of New Orleans locals and celebrities. She is also affiliated with the Radical Fairies and an initiate of the ancient art of Witchcraft. Gail Kiefer is unavailable ... but you can arrange a call back!